Lifeboat Crew of Laura Moncur - John (Jake) Murray 2nd Coxain, Geddes Wood, Navigator and Radio operator, Kenny Farquhar, Bow man. It used to be a cherished feature of a Moray community. 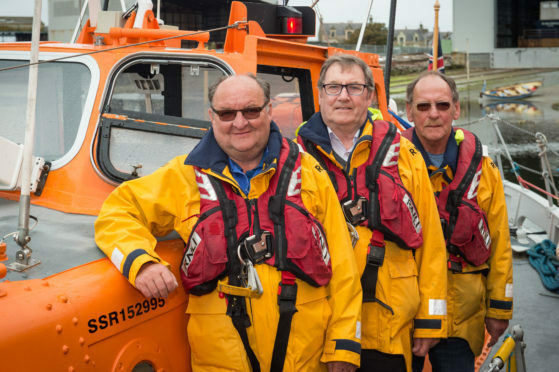 So there was an emotional response from Buckie residents when a legendary lifeboat returned to the harbour yesterday after an absence of more than three decades. The Laura Moncur served the town’s port for over 20 years between 1961 and 1984. Former crew members and locals who remembered the vessel gathered at the harbour to welcome it home. Jake Murray was a second coxswain aboard the lifeboat, and was thrilled that she was returning to her old stomping ground. Mr Murray was one of three Laura Moncur crew members who greeted the vessel after she steered into the harbour. Geddes Ward was a navigator and radio operator on the lifeboat while Kenny Farquhar was the bowman. Mr Farquhar said: “It’s great to see her, it has been a long time since I’ve been aboard her. It’s been 35 years since she left, and she was my first boat, I was aboard the William Blennin and the Charles Brown. Buckie was the latest stop in a coastline tour of the UK for the former Watson class lifeboat. She was fully restored by new owner Mark Waltham, who found the vessel in a dilapidated state and worked tirelessly to fix it. He said: “I’ve worked on her for two and a half years, six days a week to restore her back to her old glory. “I originally bought the boat with my sister Nicola as a sort of tribute to my parents who had died because we used to have pleasure boats in the family. The Laura Moncur will take pride of place at the RNLI open day this weekend, where she will sit side-by-side with the current lifeboat the William Blennin.